ThoughtCriminal Snowden is reported to have escaped from the Outer Colonies and is moving in system, possibly toward Earth. Be on the lookout for this very dangerous man. If seen, call Central Intel immediately. 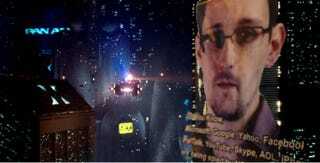 Snowden is a dangerous man, filled with dangerous, contagious ideas. Do not engage in conversation at risk of mind wipe.